“Let him who has my word speak my word faithfully” (Jeremiah 23:28). It has been correctly observed that preaching in Africa is almost always topical, and with time the topical preaching has gone from the weird to the most absurd. God’s people are surviving on what the preachers want them to hear even if it has little or no relation with the Bible passage that is read at the start of the sermon. Platitudes of common sense have replaced the exposition of God’s Word. In other cases, preaching amounts to nothing more than a tirade of scolding at the top of a preacher’s voice. In the light of all this, there is little surprise that the churches are largely terribly malnourished. As long as this continues to be the staple diet of the churches, there is no hope for the African church to be the salt and light that this continent needs. Thankfully, there are good exceptions. 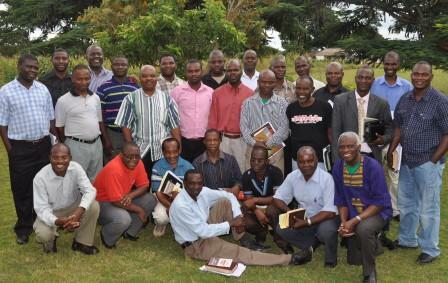 I have just spent the last few days at a Langham Preaching Seminar here in Lusaka, with Emmanuel Oladipo. He is originally from Nigeria, and in view of a recent post, I readily admit that God has a sense of humour! The theme was “Preaching that is Faithful”. Emmanuel was a very qualified speaker. 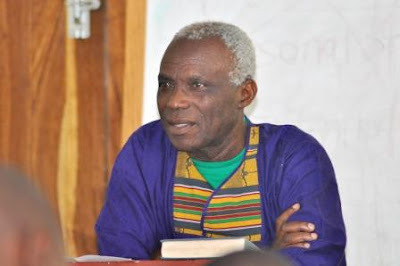 “Starting as a travelling secretary with the Fellowship of Christian Students in Northern Nigeria, he has been in full time Christian work since graduating from Ahamadu Bello University in 1967 until his recent retirement. He was African Regional Secretary of Scripture Union for ten years before moving to the UK on his appointment to head up the world-wide movement. It is a ministry which has taken him to over 100 countries. 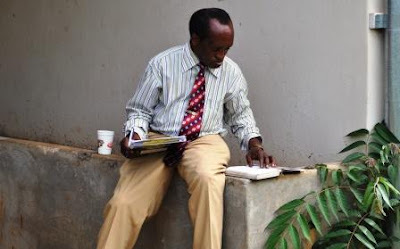 Emmanuel attributes his knowledge of the Scriptures not to what he learned at the Bible College but rather to his daily Quiet Time using Scripture Union notes over a period of 50 years” (From the back cover of his book, What the Bible Teaches on Tithes and Offerings). We were about 25 preachers who attended the seminar, from different denominations in Lusaka. We were all with some previous training and experience in preaching, but the appreciation for the seminar was expressed by everyone in attendance. The model from Ramesh Richard’s book, Scripture Sculpture, was used. In the study of the text, Ramesh goes from “the meat of the text,” to “the skeleton of the text”, and finally to “the heartbeat of the text”. He does the same with the sermon construction, but goes backwards from “the heartbeat of the sermon,” to “the skeleton of the sermon,” and finally to “the meat of the sermon.” As a teaching tool, this model is very good. 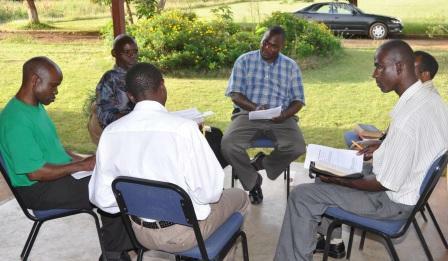 The first full day was spent on how to study a text of Scripture prior to preparing a sermon from it. Since the Bible is God’s Word, the place of prayer was emphasized from the very beginning. Then the spade work of exegesis was brought in. We worked on Deuteronomy 12:1-12 and Acts 12:1-17. The discipline was to avoid thinking about the sermon during this stage. It was all about understanding the Word of God as it came to its first hearers—in their time, culture and language. The day ended with Emmanuel preaching from Acts 12 and subjecting his preaching to our evaluation. The second full day was spent on how to work from the text to the actual sermon. This time it was Malachi 3:6-12 and 2 Samuel 13:1-19. We spent quite some time debating the issue of tithing in New Testament times. It was good to hear the age-old arguments flying across the room from the Bible and not from denominational preferences. The second day ended again with Emmanuel preaching from 2 Samuel 13, and again with humility subjecting his preaching to our evaluation. Most of the work during this seminar was done as we spent time alone working on texts of Scripture and then we were divided into small groups for the purpose of synchronizing our work. It was during these personal and group periods that most of the wrestling with Scripture was done, until sermonic material began to flow. It is this hard work that many preachers do not want to go through. Yet, just as there is no good physical health without exercise and sweat, there is no good preaching without hard exegetical spadework. We African preachers have to learn that there is no graduating from this if we are to remain faithful to our work. We must remain preachers of God’s Word! The easy way out is that of claiming to be preaching God’s Word when in actual fact we are sharing the figments of our own imagination. This ploy, which is so common today, is nothing new. God, through Jeremiah, thoroughly condemned it. He said, “I have heard what the prophets have said who prophesy lies in my name, saying, 'I have dreamed, I have dreamed!' How long shall there be lies in the heart of the prophets who prophesy lies, and who prophesy the deceit of their own heart… Let the prophet who has a dream tell the dream, but let him who has my word speak my word faithfully… Therefore, behold, I am against the prophets, declares the Lord, who steal my words from one another… Behold, I am against those who prophesy lying dreams, declares the Lord, and who tell them and lead my people astray by their lies and their recklessness, when I did not send them or charge them. So they do not profit this people at all, declares the Lord” (Jeremiah 23:25-32). The message from Jeremiah is very clear. Every month, for the last one and a half years, I have been hosting a small group of about 10 to 15 pastors in our neighbourhood for this very purpose. Each month one of us brings a sermon that he recently preached or intends to preach. We then go through his sermon preparation process together and use that as a plumb line to see how faithful he was to the text of Scripture. Faithfulness—that is the key! These monthly meetings have been very enriching times for all the pastors in my neighbourhood who attend them regularly. 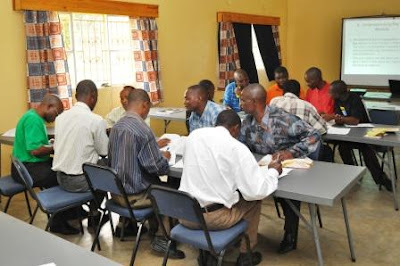 These pastors come from various denominations: Pentecostal Assemblies of God, Reformed Church in Zambia, Pilgrim Wesleyan, United Church in Zambia, Presbyterian, Evangelical Church in Zambia, Baptist, Brethren in Christ, independent Charismatic/Pentecostal churches, etc. It has been wonderful to see the change that has taken place in some who were initially disillusioned about expository preaching or just never knew how to allow the Bible to speak for itself. Now they want their friends to also attend such meetings regularly. However, we limit the numbers to maintain some level of intimacy. “I have a dream” that one day pulpits in all these denominations in Zambia, and perhaps across Africa, will faithfully expound God’s Word in the power of the Spirit. However, we will not get there simply by dreaming. It is through ongoing seminars like the one we have just had with Emmanuel Oladipo—attended by those who are already in ministry and who may have abandoned expository preaching soon after stepping off the graduation podium—that we will give that extra impetus to weary preachers to keep going. Africa is in desperate need of faithful expository preachers! Pastor Mbewe, an enriching post indeed for the time that the apostle Paul was referring to in 2 Timothy 4:3-4 is evidenced today when many do not endure sound doctrine and alas preachers give in to preaching what the listeners ears itch to hear.Therefore seminars like these will go a long way in helping God's messengers to faithfully expound His word. Oh that many will apply and qualify for the position at the top of this blog. It is given by Dr Joel James, my pastor. He studied at The Master Seminary and did his Doctors specializing in teaching how to do expository preaching. We also having our annual Shepherds confrnce in May. Byron Yawn is one of speakers a graduate of The Master&undefined;s Seminary and serves as the senior pastor of Community Bible Church in Nashville Tennessee. He is the author of Well-Driven Nails, a book on preaching that features extensive interviews with and lessons from the preaching of John MacArthur, RC Sproul, and John Piper. This is the most encouraging post I have read in quite some time. I'm warned to heed the common dictum, "a little knowledge is a dangerous thing." It is easy to think that sitting under a faithful preacher enables us to absorb their method by "osmosis". Yet when I understand how much grappling with Holy Writ undergirds good exposition, it shames my shallow preparation even on simple topics, and for unsophisticated hearers. The comments above further challenge and inspire me. It has struck me, though, that accurate discernment of the message of Bible passages will automatically "reform" some of your pastor class without them realising it! Reformed in all but name they shall be, and all to the benefit of God's people! Thank you. As one in training at GfBC in Houston, Texas, I am most thankful to our God for this article - as it does indeed hit at the heart of preaching. We were blessed beyond words to have you here this past weekend and pray the Lord will continue to work in and through you for His glory. Many at GfBC were convicted and encouraged, grateful for His work in our souls. You are all in my prayers...ceaselessly!